Five months after the 1934 Cardinals won the World Series title in seven games against the Tigers, owner Sam Breadon expressed a desire to move the franchise from St. Louis to Detroit. Disheartened by attendance figures for a franchise that won five National League pennants and three World Series championships from 1926-34, Breadon was willing to relocate the Cardinals after a bid to sell them collapsed. The Cardinals’ regular-season home attendance in 1926, when they won the pennant and World Series title for the first time, was 681,575. It increased to 778,147 in 1928, when they again won the pennant. After the Great Depression began soon after the stock market crash of October 1929, Cardinals attendance spiraled, even though the team was successful. The Cardinals, who shared Sportsman’s Park with the American League Browns, drew 519,647 during the regular season in 1930, when they won their third pennant. Their attendance was 623,960 in 1931, when they won the pennant and World Series title. After regular-season attendance totals of 290,370 in 1932 and 268,404 in 1933, the Cardinals drew 334,863 in 1934, when the colorful Gashouse Gang team of Dizzy Dean, Joe Medwick, Pepper Martin and Frankie Frisch won the pennant and World Series crown. 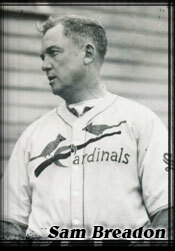 Fearing for the long-term financial prospects and figuring the value of his World Series championship club was at a premium, Breadon instructed general manager Branch Rickey to negotiate a sale with Lew Wentz, an Oklahoma oil baron who offered to buy the Cardinals. With no prospects of a sale, Breadon explored relocation as an option. On March 28, 1935, during spring training in Bradenton, Fla., Breadon told reporters he would move the Cardinals to Detroit if Tigers owner Frank Navin approved. The 1934 Tigers had a regular-season attendance of 919,161 _ nearly three times the Cardinals’ total _ and Breadon saw the job-generating Motor City as a town better suited than St. Louis to support two major-league franchises. In its April 4, 1935, edition, The Sporting News claimed Breadon “was merely doing a little off-the-record wishing” when he expressed interest in relocating the Cardinals to Detroit. Navin had no interest in sharing his market with the Cardinals, The Sporting News reported. Still, the magazine left open the possibility of a Cardinals move. The Cardinals’ regular-season attendance improved to 517,805 in 1935, when the team finished in second place. Still from 1935 through 1945, the Cardinals never drew more than 642,496 for a regular season. In 1946, the first regular season after World War II, the Cardinals totaled an attendance of more than a million for the first time since the franchise began in 1892.